Encapsulated Stained Glass, Methodist Church, Byfleet, Surrey. 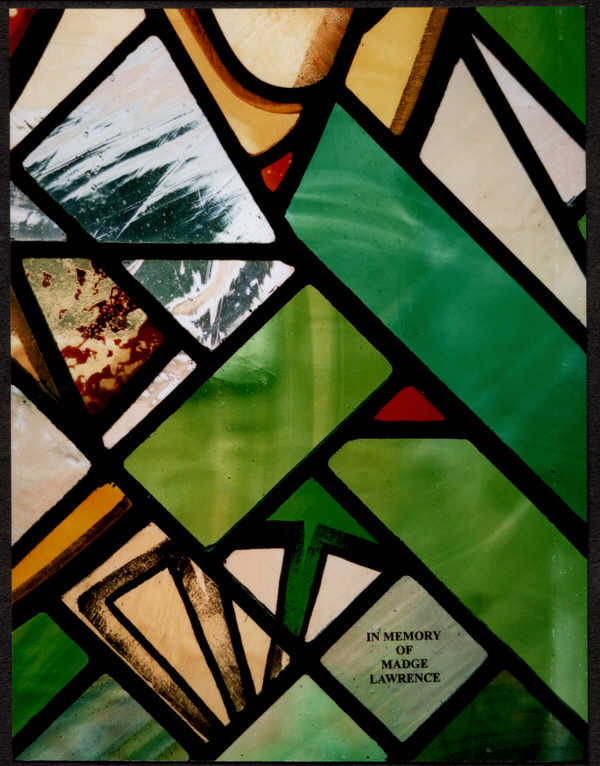 This stained glass window was commissioned in memory of a parishioner. Her favourite colours were red, green and yellow. I have used my technique of acid etching a texture on sheets of glass and then using this within the window cut into small pieces. The whole stained glass window is full of Christian symbolism. The woven theme of this window evokes the way in which the Christian faith touches every part of life. In the centre I have placed the triquetra, an early symbol of the Holy Trinity. The three equal arcs express eternity in their continuous form; indivisible in their interweaving and at the centre is a triangle, again an ancient symbol of the Trinity. Surrounding this are more equilateral triangles and a sun, a symbol of life and hope. 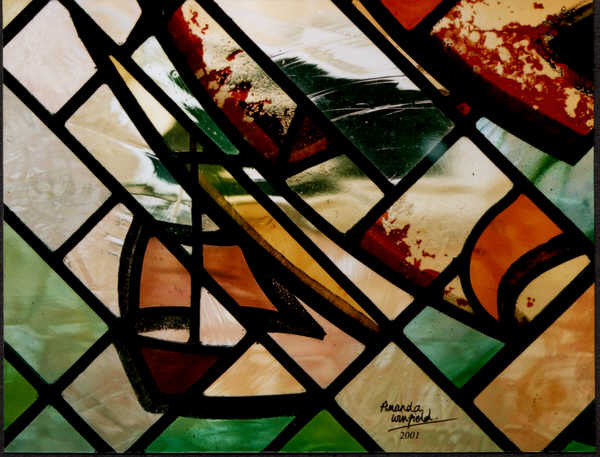 Appearing in the top left-hand corner of the stained glass window is the Dove, expressing innocence and purity. Signifying the Holy Spirit and the presence of God as hovering over the water at Creation and above Jesus at his Baptism. In the top right-hand corner is an olive branch. A symbol for peace, harmony and healing. In the bottom left hand corner I have painted an ancient ship, symbolising the church as a place where the voyagers of faith can ‘gather and sail over the rough areas of life to the good destination God has for them’. In the bottom right corner I have depicted the nails driven through the palms and feet of Jesus at his crucifixion. These are the symbols of the poignancy of His physical suffering. 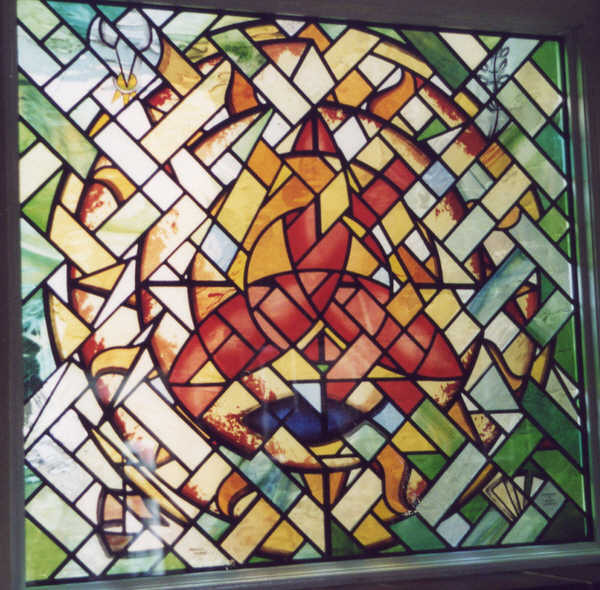 The Christian symbol of the fish can be seen at the base of the triquetra and there is a cross in the centre of the window picked out in a heavier lead. 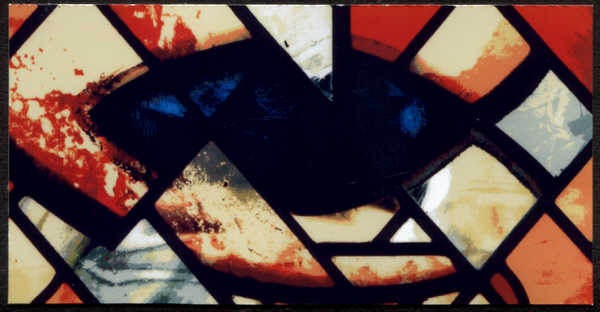 The red stained glass signifies the blood of Christ, life and later on meaning sacrifice. Yellow stained glass symbolises energy and green stained glass is associated with growth and light blue with hope.